Gostynnyj Dvir "Knyaz' Golitsyn" is situated in the most unique corner of the Eastern Crimea - in the village Novyi Svit. 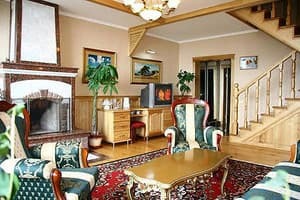 Gostynnyj Dvir "Knyaz' Golitsyn" is built with the maintainance of the best traditions of the palaces, that allows you to feel yourselves noblemen of the kings' and court women's epoch. 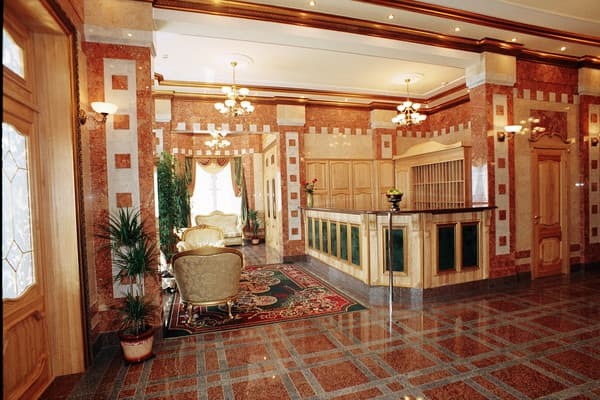 The interior of the hotel is of natural materials - wood and marble - and it immerses you in the atmosphere of comfort. 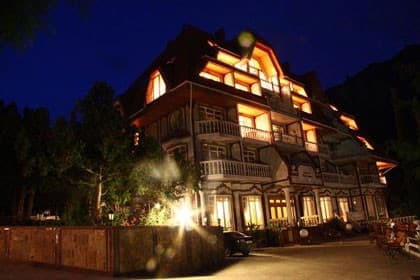 The balconies of the rooms overlook the bay of the village Novyj Svit which is called Zelena. From every quarter, except for the southern,the bay is surrounded by the mountains. Such a location of the bay contributes to the formation of a special microclimate, in which coniferous plants of the tertiary period have been preserved. 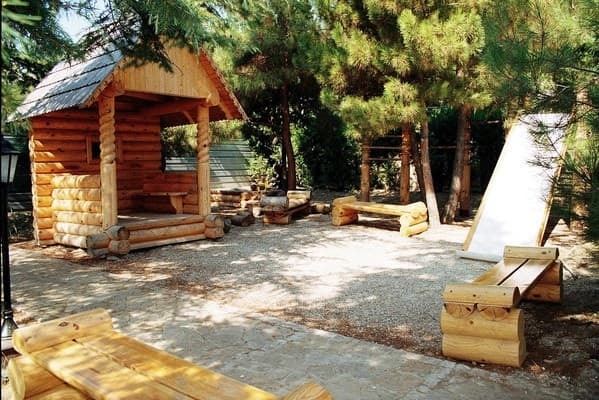 The air is filled with the scent of a relict Sudak pine, juniper, that has a favourable effect on the person's organism. 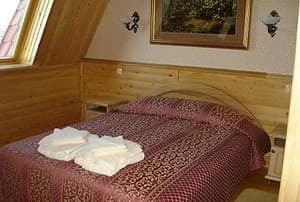 While resting here you will get unforgettable impressions and there is no doubt that you will come back to Novyj Svit again. 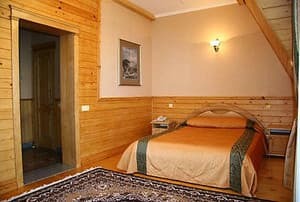 Description of the room: TWIN MV - double standart room with a view of the mountains. The room has: 2 sesquialteral beds, wardrobe - compartment with mirror doors, mini-bar, safe, electric towels` dryer, hair-dryer, cable television, telephone. Bathroom unit - shower cubicle. The approximate total area - 22-25 square metres. Maximum quantity of guests - 2. Description of the room: TWIN SV is a double standard room facing the sea. The room includes: 2 sesquialteral beds, a sliding wardrobe with mirror doors, a mini-bar, a safe, an electrical towel dryer, a hair dryer, a cable TV, a telephone. The approximate area is 22-25 sq.m. The maximum number of guests amounts to 2. 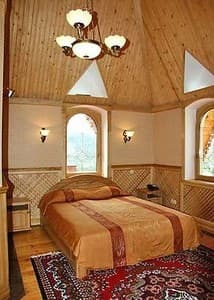 Description of the room: Studio MV is a double room with improved design facing the mountains. The room includes: 2 sesquialteral beds, a sliding wardrobe with mirror doors, a mini-bar, a safe, an electrical towel dryer, a hair dryer, a cable TV, a telephone. The WC is a shower cabin. The approximate area is 25 sq. m. The maximum number of guests amounts to 2. Description of the room: FAMILY is a triple one-and-a-half-room suite of improved planning facing the sea. Between the rooms there is an arched entrance. Perfect for families with children. The suite includes: a sliding wardrobe with mirror doors, a double bed, a sofa, a mini-bar, a safe, an electrical towel dryer, a hair dryer, a cable TV, a telephone. The WC is a bathroom. The approximate area is 30 sq. m. The maximum number of guests amounts to 4. Description of the room: Studio SV is a double room with improved design facing the sea. The room includes: 2 sesquialteral beds, a sliding wardrobe with mirror doors, a mini-bar, a safe, an electrical towel dryer, a hair dryer, a cable TV, a telephone. The WC is a bathroom. The approximate area is 30 sq. m. The maximum number of guests amounts to 2. Description of the room: FAMILY is a triple one-and-a-half-room suite of improved planning facing the sea. Between the rooms there os an arched entrance. Perfect for families with children. The suite includes: a sliding wardrobe with mirror doors, a double bed, a sofa, a mini-bar, a safe, an electrical towel dryer, a hair dryer, a cable TV, a telephone. The WC is a bathroom. The approximate area is 30 sq. m. The maximum number of guests amounts to 4. Description of the room: A penthouse - a two-level suite. On the ground floor there is a comfortable sitting room, on the second floor there is a bedroom with a double bed. The suite includes: a sliding wardrobe with mirror doors, a mini-bar, a safe, an electrical towel dryer, a hair dryer, a cable TV, a telephone. The WC is a bathroom. There is also a separate guest toilet on the ground floor. The approximate area is 55 sq. m. The maximum number of guests amounts to 4. Description of the room: The Grand Penthouse is a two-level suite. On the ground floor there is a cozy kitchen with full equipment necessary for cooking, and a bedroom with a double bed; the kitchen on the second floor leads through a spiral staircase to another bedroom with a double bed. The suite includes: 2 mini-bars, a safe, an electrical towel dryer, a hair dryer, a cable TV, a telephone. The WC is a bathroom. There is also a separate toilet for guests on the second floor. The approximate area is 35 sq. m. The maximum number of guests amounts to 4. Description of the room: Lev Golitsyn is a two-level suite. 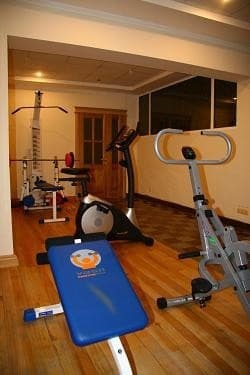 On the ground floor there is a comfortable living-room where one can invite friends. On the second floor there is a bedroom with a double bed and a bright study with windows offering a soothing view of the bay of the New World. Perfect for long stays. The suite includes: 2 mini-bars, a safe, an electrical towel dryer, a hair dryer, a cable TV, a telephone. The WC is a bathroom. There is also a separate toilet adjusted to the bedroom on second floor. The approximate area is 50 sq. m. The maximum number of guests amounts to 4. Description of the room: The fireplace unit is a two-level suite with a working fireplace.On the ground floor there is a living room with a fireplace, by which, during quiet cool evenings, one can sit in a comfortable rocking chair with friends over a glass of champagne "New World". 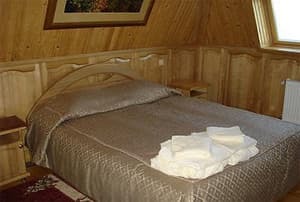 On the second floor there is a comfortable bedroom with a double bed. The suite includes: a sliding wardrobe with mirror doors, a mini-bar, a safe, an electrical towel dryer, a hair dryer, a cable TV, a telephone.The WC is a bathroom. There is also a separate guest toilet on the ground floor. The approximate area is 55 sq. m. The maximum number of guests amounts to 4. Гостиница в целом не плохая. Довольно комфортно, номер чистый и светлый, довольно просторный. Персонал вежливый. Цены приемлемы. Отрицательным моментом считаю то, что в гостинице предоставляют мало желаемых услуг. Children under 5 are accommodated free of charge with giving an extra place. A bed with orthopaedic mattress ig given to babies. Meal for children, optionally if parents wish, is offered in the framework of the childre's menu for the additional price. The price for an extra place in the room - 350UAH. Ukraine, Crimea, Sudak city, suburban area Novy Svit, L. Golitsyna Street 5. 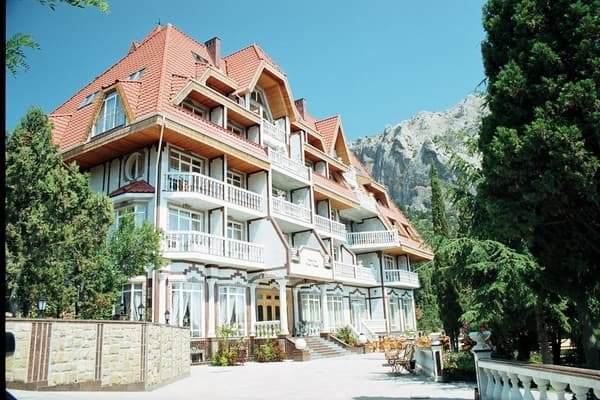 To Simferopil' - by plane to the airport or by train to the railway station, then by a straight fixed route taxi to the bus terminalof the city Sudak - Novyj Svit or a transfer to the hotel (additional payment).